Recently I have been getting a lot of traffic for an old post. An really old post. With terrible pictures and links that don’t work anymore. And while the pictures may be awful, the recipes are great and still two of my favourites. That is why I want to update them today. They are Christmas recipes and I am aware that I am pushing the season very early this year. But you never know what will happen in December. I know me and I’ll probably post the next cookie recipes two days after Christmas. Plus, we already went to see a Christmas movie at the cinema yesterday and my kid is singing “Oh Tannenbaum” 24/7. The old post I want to brush up here had a recipe for cinnamon stars (cookies) and speculoos truffles based on my recipe for speculoos spread (cookie butter). For this entry, I updated both the recipes and the pictures. There are corners of this blog which are such a building site and a few items definitely need a bit of remodeling. 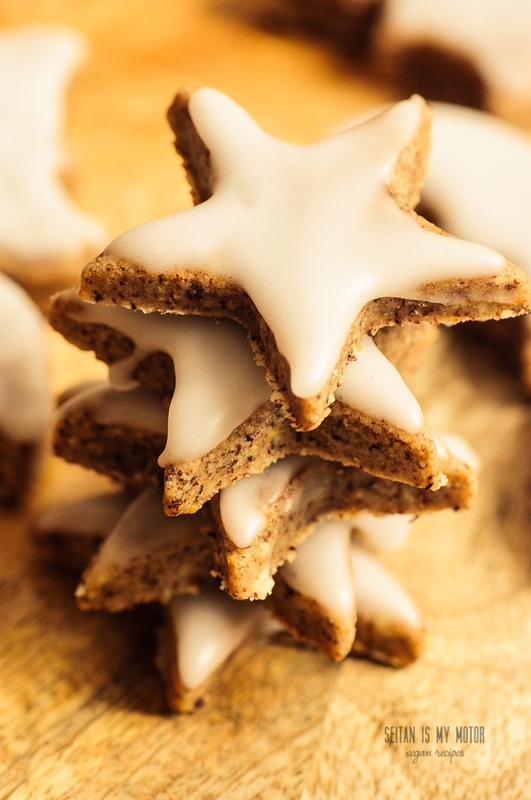 These gluten-free cinnamon stars are a very traditional and well-known German Christmas season cookie. They are in a way the elegant version of macaroons, because recipes always call for lots of meringue. The first time I posted this to the blog I winged it somehow. I made flax eggs and added rice syrup. At that time I thought I had ended up with a decent enough result. That was way before we all discovered the magic baking properties of canned chickpea water aka aquafaba. 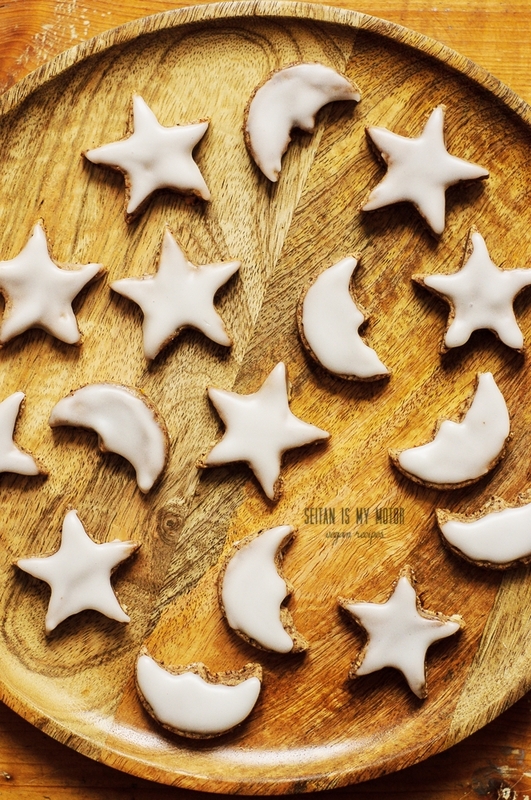 And of course, if you make these cookies with aquafaba, they turn out absolutely perfect! They aren’t too crispy and even will soften after a day. Which is how I remember the original version. The only trick here is to whip up the aquafaba really thick. It should have almost the same texture as marshmallow fluff. To do this, I always use a pinch of guar gum. In Germany, guar gum is often available at health food stores whereas xanthan gum is much harder to find. If you can only find xanthan, you can use that instead. If you cannot find both of these or don’t want to use them, use half a teaspoon of lemon juice or white vinegar instead. That should do the trick. You have to whip up the aquafaba in two steps: First you mix the liquid with guar gum (xanthan etc.) and beat it for 5 minutes until it has stiff peaks. I always use a handheld mixer for this. Then you add about 25 g (1/4 cup) of powdered sugar and whip until the mass is very thick and looks similar to the marshmallow fluff on of the pictures here. It needs a solid texture, so it will hold all the ground nuts you have to mix in later. The second recipe I am updating today is a chocolate candy made from speculoos spread (biscoff spread or cookie butter). Back in 2009 I was one of the first who made a homemade version for the at that time trending spread. It is easily made at home from the popular Lotus (Biscoff) caramel cookies (speculoos) but I often use traditional German spekulatius cookies. When I made this the first time I used traditional ingredients that were quite similar to those found on the package of a jar of speculoos spread. One of the ingredients was refined coconut oil. I still use this fat a lot but I know that some people cannot tolerate it very well. So I do now have an updated version made with nut butter. You should probably try both of today’s recipes, but the speculoos truffles are very addictive. I love to give them as a present, too. Also, if you’re going to watch the US election tomorrow, you might want some food helping you deal with all the stress. Place aquafaba (liquid from a can of chickpeas) and guar gum in a narrow bowl. With a handheld mixer whip for 5 minutes, or until stiff peaks form. Add 25 g powdered sugar and whip for another 2 to 5 minutes, or until the mixture resembles thick marshmallow fluff or very stiff whipped cream. Place remaining ingredients in a large bowl and mix well. Add whipped aquafaba and use a spatula to fold it into the nut mixture. This will take one or two minutes. Your dough will be stiff and sticky. Preheat the oven to 150°C and line two baking sheets with parchment paper. Roll the cinnamon star dough out 1/2 cm thick) between two sheets of plastic wrap. Cut out as many cookies as possible. Form the dough scraps into a ball, roll out again and cut out more cookies until no dough is left. Place on a baking sheet. Bake one sheet at a time for 11 minutes or until the bottoms are only slightly browned. To make the frosting, place powdered sugar in a small bowl and add lemon juice by the teaspoon. You'll want a stiff frosting that can be spread but will not drip off your cookies. Dip the cookies upside down into the frosting and let dry on a cookie sheet. Store in an airtight container. The cookies will soften after a day. Use a food processor to grind your cookies into a very fine meal. Stir until everything is combined well. Melt your dipping chocolate and have a piece of parchment ready. Remove your spread from the fridge and use a teaspoon to scoop out a portion of the spread. You can form it into balls or shape it only roughly. Dip into the melted chocolate and let dry on a piece of parchment paper. Kann ich Dir leider gerade nicht sagen. Well, I don’t know. If you followed the recipe it should work. From here and with this little information it’s very hard for me to find out what went wrong. I would like to try the speculoos balls, could I try it with margarine/vegan butter instead of the coconut oil/or nut butter? (less expensive!) Thank you!! That should work, Tatiana! You just might need to adjust the amount of margarine used, but I am not sure. Also, make sure your margarine is soft so it will blend well. Hey Alexis! I hope you realise these aren’t spekulatius. They are chocolates filled with cookie butter. But there’s a recipe for the cookies linked to. I absolutely adore Spekilatius (or however they’re called haha) but I never buy them because they always contain either butter or palm oil :( I recently tried the new ones by Veganz, which are really yummy but not that spicy. I love that your recipe doesn’t call for any butter/fat either!! I think I’ll have to try them! Oh those zimsterne are probably one of the first recipes I saw and made from your blog and have made them quite a few times because they are so delicious and easy and gf and vegan – I would like to try these with aqua faba but I think that the linseeds or flaxseeds worked really well and means not having to get out the electric beaters. 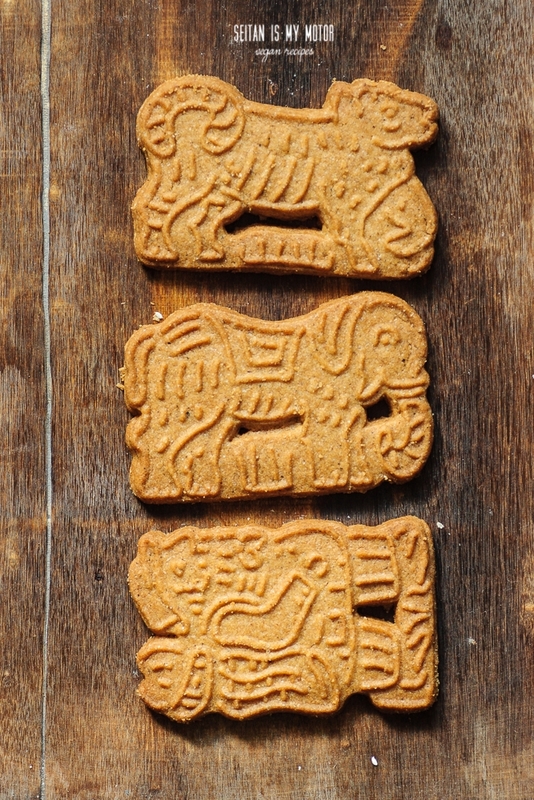 Have never tried speculoos but maybe one day! Am sure I would love these too. Thank you, Johanna! I still have the old recipe, so if you ever need it, just let me know! I have no intention of watching the election tomorrow but I feel like I could still do with some stress relieving Speculoos truffles. I think these may also make the perfect homemade gifts this year!